What is a Walking Audio Book ? A Walking Audio Book is a simple idea to link the progression of a story with the progression of the walk by converting our steps in space and/or time value, where the body and the mind are interconnected for a deep embodied listening process. This website presents an editorial project with the goal to spread a set of original Walking Audio Books. Our upcoming project, a Big Walk in time where each step is a million year ! 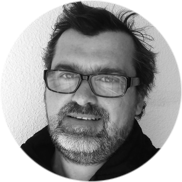 We are collaborating with the Schumacher College in England, the cradle of the Gaia theory, with the scientist Stephan Harding. We are creating probably the first Walking Audio Book of all times called Deep Time Walk. It’s a project leaded by Geoff Ainscow. Art Direction by the GPS Museum Lab. 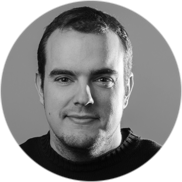 We are working closely with the programmer Carlos García from thecoder.es in a powerful innovative Walking Audio Book software engine. We have had the chance to collaborate with Rich Blundell, a stunning creative scientist exploring new ways to teach the wonders of the Universe with mobile technology. 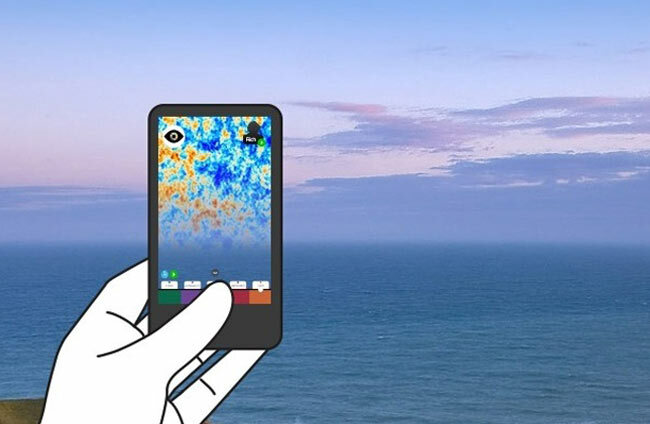 We created Cosmosis1, a experience where you are walking with Rich in the forest and you are invited to use your smartphone’s camera to see by yourself the Cosmic Background Radiation ! Art Direction by the GPS Museum Lab. The programming has been done by Carlos García from thecoder.es and Fernando Ruiz for the camera mode. For more details, i wrote the Chapter 16: “Mobile Content and Walking Documentary. Teaching and Learning Science Step-by-Step with Smartphones”. We are not the owners of our creative ideas, they are made of an incredible intricated flow of experiences and thoughts emerging all around us. Who knows if the Walking Audio Book was imagined for the first time in the XV century in a remote forest during a nice walk. As an echo, a gift, a legacy from the past, here is how it happened. Being born with both tweested feet give an opportunity to value how important and marvelous is the act of walking on both feet. Each step we take on the floor leads us to a long journey, going around the Earth three times during our life span. At the age of 6 an unusual experience happened to me during medical treatment under the influence of morphine. A very strange structure was spinning in front of my eyes, later I discovered that I was really looking, for the first time, at human skin through a microscope. Being alive and walking had to become an amazing phenomenological journey through the exploration of the Universe step by step. Let's avoid the dualistic view of the separation of the mind and the body, it is time to think with every cells of our body in motion. The Walking Audio Book is conceived for a encounter with the body and the mind, unfolding a great secret that no mind sitted on a chair could reach. We can walk in Time and Space by a embodied perception, converting each step in a time or scale value and understand in a really more poweful way enormous dimensions converted in outdoor breathes. Behind the Walking Audio Book, we have a powerful programming engine linking an audio player with the sensors of the mobile. The body itself is a way to interact with the narration, it is an opportunity to create innovative interactions. This engine is working on both Android and IOS. 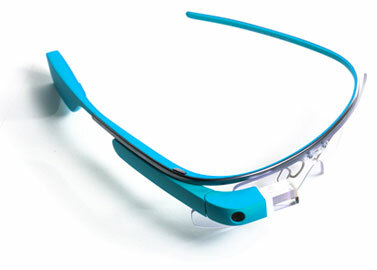 Devices like the Google Glass are perfect for a immersive Big History walk in space and time. The Walking Audio Book is responding to the upcoming revolution of wearable devices. Walk Through Time was the first prototype, a 4600 Mry walk along the evolution of life on Earth. The Walk Through Time is a project leaded by Geoff Ainscow, becoming now the Deep Time Walk. The Walk Through Time iphone app first prototype is on the Apple Store ! 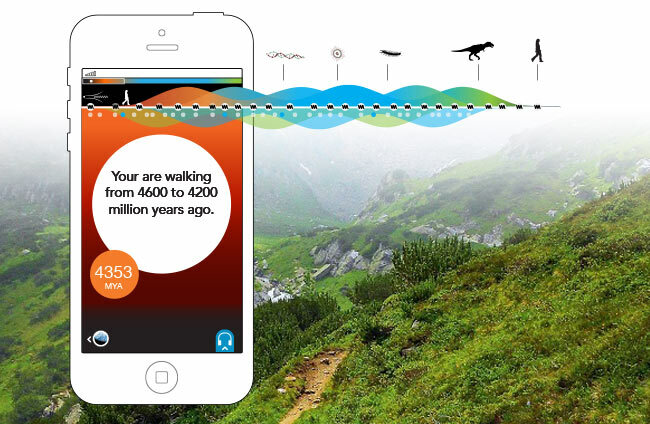 The Deep Time Walk app for iphone and Android will be available in October 2016. The Cosmosis1 app for iphone and ipad is now on the Apple Store ! Below, a short description of groundbreaking walking apps, we are expecting to do one day for the Big History community. Saturn Rings Walker is a 80.000 km walk along the rings made of several types of materials, a 8 km walk at the speed of 10 km per step. Learn about the major Saturn's moons and see earth as a pin dot lost in the dark from this new cosmic perspective. Atom Walker is a 0.59 Angstrom walk deep inside the matter starting from the center of the nuclei and walk towards this tiny electron. You never see it and know his velocity at the same time. You are crossing the field of the quantum mechanics and discover the infinity of micro worlds. Milky Way Walker is a 120.000 Light Year walk through the Galaxy that welcome us in her womb. Walking at the pace of 1LY per step and you will need to walk during 150 km to cross it. Take a few months walking each days to make this marvelous walk where you will learn what our galaxy is made of and how far we are from the central black hole. Solar System Walker is a 1.87 Light Year space travel from the core of the Sun towards the Oort cloud. A quite short walk if we just want to walk to Pluton at 1 million kilometres per step but a very long walk to reach the frontieres of the solar system. On the prototype Solar System Walker, the walker is throwing a scalable model of the solar system by gesture.